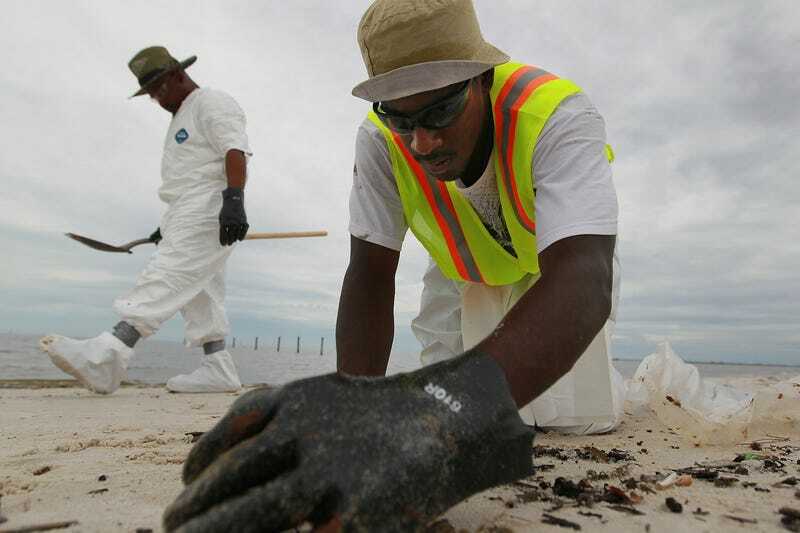 Ever since the BP oil spill disaster began, a glut of contracts and jobs has surfaced. But who is benefiting? If you got an oil spill contract from the federal government, more than likely you are white. If you're not white, and you're fortunate enough to be working in the oil cleanup, then you're likely to be involved in the more hazardous jobs, according to organizations monitoring the situation on the ground. An NAACP investigation by staff who toured the Gulf of Mexico and interviewed residents and workers concluded that, "Community members and business owners [of color] have been locked out of access to contracts for cleanup and other opportunities related to addressing this disaster." In a letter from NAACP President Benjamin Jealous to BP CEO Tony Hayward, the civil rights organization noted that "contractors of color are not receiving equal consideration for opportunities to participate in mitigation efforts." If information from the Federal Procurement Data System about oil spill contracts from the federal government is any indication, the NAACP is right. According to the latest data set, dated July 9 (though the agency warns its report lags "the work that has been awarded to date"), $2.2 million of $53 million in federal contracts — 4.8 percent — has gone to small, disadvantaged businesses. Women-owned businesses have landed 4.2 percent of contracts. Of 212 vendors with contracts, just two are African American, 18 are minority-owned, none are historically black colleges or universities — despite the three in New Orleans alone: Xavier University, Dillard University and Southern University at New Orleans. And while BP is supposed to take full financial responsibility for the oil spill, Congress is looking for ways to make victims of the Katrina floods pay for it. A bill passed by the House last week would grab $400 million from Louisiana's Road Home program — created after Katrina for people to rebuild homes lost in the floods — to use for BP's spill and the Afghanistan War. That bill is currently pending in the U.S. Senate. New Orleans residents weren't responsible for the 2005 disasters that took their homes — the U.S. Army Corps of Engineers failed to build protective levees — but now they'll be paying for another disaster not of their making. But if minorities haven't been benefiting from the millions in contracts, they can't be happy either with the kind of jobs made available by BP. As The Root first reported back in May, African Americans are among the most affected by the spill. The bays around Plaquemines Parish — where black fishers from the communities of Pointe a la Hache, Phoenix and Davent have trawled for shrimp and oysters for decades — have been closing, putting an abrupt end to the livelihood of hundreds. For those fishers who've been put out of work, BP has offered a limited number of jobs through its Vessels of Opportunity program to allow boat owners to help skim oil and deploy boom. These jobs have proven to include high levels of risk and hazard and have led to illnesses and injuries — even suicide — among already despondent workers. The exposure to fumes from the oil and dispersant mixtures has created cases in which workers have suffered nausea, headaches and other more serious health problems. —On June 23: "Worker placed hand on exposed pipe, which had rough edges and cut worker's left hand; laceration on palm." —On June 20: "Worker was found lying on ground next to chair; was unresponsive; regained consciousness 10 minutes later; dehydration." —On June 18: "While pressure-washing the deck, water pierced worker's boot, causing a burn/puncture wound to left foot." —On June 2: "Worker engaged a hydraulic rope winch and his fingers got caught between the rope and the spool. Left fifth finger last joint amputated except for small amount of skin." Cases like these makes you wonder why the workers weren't supplied with thick enough gloves and boots to prevent these accidents, or why there isn't a supply of water on hand to prevent dehydration. On June 14, there were four cases of "fatigue, drowsiness, fainting; diagnosed as carbon monoxide poisoning" — yet, in a call with environmental justice leaders, a representative from OSHA said they are not recommending respirators. Just last week, OSHA assistant secretary David Michaels expressed concerns that the workers haven't been getting proper training: "Employees hired to be supervisors in the onshore and marine cleanup are required to receive extensive training. A rigorous program is required under OSHA's Hazardous Waste Operation and Emergency Response Standard." At issue is the fact that oil spill workers have been getting only four hours of training, as opposed to the 40-hour "HAZWOPER" training — to which Michaels is referring — required for this kind of work. Interestingly enough, the New Orleans-based Deep South Center for Environmental Justice has already been offering this training for years — with a focus on young minorities who are normally excluded from the workforce. Along with the United Steelworkers, the Deep South Center has provided hazardous material training and jobs in times of disaster, as they did after Hurricane Katrina when they created the "A Safe Way Back Home" program. During a recent meeting of the Deep South Center held at Dillard University, a black college in New Orleans, director Beverly Wright said, "We know from our history that four hours is not adequate for the best kind of training. They need to know about protective equipment and safety. Are they developing training exclusively for the fishermen? If we ever get supplemental funding, a lot of that should be targeted for the fishermen." Wright comes from a long line of women who have advocated for environmental and worker safety: Pam Dashiell, Wilma Subra, Jane Addams, Florence Kelley and Alice Hamilton to name a few — these are women who have been at the forefront, not in the margins. This shows that what the NAACP and other organizations such as the Louisiana Justice Institute and the Equity and Inclusion Campaign have reported is correct. It also means that the burden of ensuring that minority fishers, local business owners and nonprofits are included has fallen on local foundations such as the Louisiana Disaster Recovery Foundation and the Gulf Coast Fund. These entities have provided their own worker safety equipment and trainings, and provided grants when BP and government contracts have been elusive. The same has occurred through the disasters of Hurricane Katrina, Rita, Gustav and Ike. How many more disasters have to happen before the purse holders learn to finance and restore the local and most vulnerable ahead of everyone else? Brentin Mock is a reporter for the New Orleans investigative-reporting news Web site The Lens.